Medical Chillers are the most important device used to manage water or glycol temperatures, to achieve the optimal medical equipment and system temperature. Scanair glycol and water chillers are self-contained devices with fluid temperature being digitally controlled by microprocessor, which will be maintain accuracy ± 0.1oC. Medical Chillers are manufactured, custom built to specifications are smaller in footprint, lightweight and easy to use with mover caster wheel. Medical Chillers precisely maintain the outgoing fluid temperature which is critical in any medical cooling application. Medical Chillers are used in radiation therapy, cancer treatment machines, blood cooling systems, laboratory applications, CT scanners, MRI machines and PET scanners and lasers etc,. Scanair Medical Chillers are built to have a zero downtime, because of high quality components provided to compensate in the case of equipment failure. Our chillers have been tested various methods throughout the industry to meet the stringent requirements of the best medical equipment and has proven its reliability. 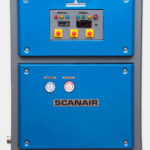 Scanair is the leading manufacturer and supplier of all kinds of medical chillers. Medical chillers are important in everyday operations at hospitals and other medical diagnostic centers. They are used to maintain temperatures of important and expensive medical equipment, as the major investments every year is mostly, in new and used medical chillers as well as their maintenance. Chillers are important in the use of CT scanners because the X-Ray tube in the scanner heats up very quickly, in one to three minutes and then must be shut off and cooled down for ten to thirty minutes. This can cost the hospital a lot of money and slow down a patient’s care tremendously. A good cooling system can create continuous long-term use in critical care situations. For the highest level of efficiency, the magnet inside an MRI scanner must be cooled as possible. The refrigerant liquid helium is often used in two type’s of available cooling methods like air and water cooled chillers. Air cooled chillers use ambient air and a water cooled chiller uses water that is around 28oC from a cooling tower. We design MRI Chillers, including Water and Air cooled chillers for the Medical and Scientific industries. We work with the finest medical equipment makers and build the chillers to their equipment needs. Capacities can be modulated with combination of multiple compressors & multiple circuits, high efficiency scroll screw compressors with stepped or variable capacity control. All process cooling systems can be offered with Air cooled or Water cooled condensers and optional adiabatic system for improved capacity and performance in high elevation or low humidity areas. Material of construction for all components including compressors motors, pumps, heat exchangers and pipelines will be compatible with process requirements of single or dual circulation pumps, with TEFC motor and automatic pump rotation and change, over PLC based automation and integration. Medical Chillers can also be offered according to specifications with all systems offered as factory built package with minimum on-site tweaks. High efficiency standard R-134A, R-404A refrigerant with alternatives available upon request, easy to operate, with dual refrigeration circuits and extraordinary safety protection. MS, GI coated sheet metal fabricated frame work, powder coated with mover caster wheel. Dual circuit Stainless steel SS316 Grade Brazed Plate Evaporators with glycol SS304 grade tank with large holding capacity.